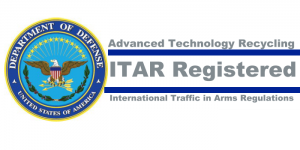 ATR provides ITAR Recycling for the Aerospace Industry, the Department of Defense, Department of Homeland Security, or any other Government Agency or company that has proprietary equipment that requires secure physical destruction. 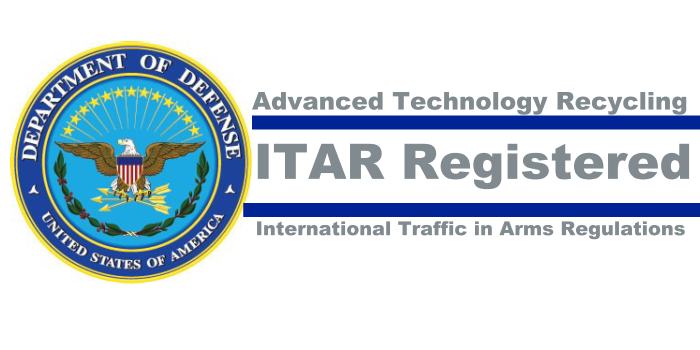 ITAR was originally developed to regulate military products and services. Now these controls cover many products that are commercially manufactured for any military use. Many of these items were developed originally for military purposes but have evolved into mainstream commercial products – in the electronics navigation, computer security, maritime, aviation, and other industries. At the core of the ITAR Requirements is a list of products called the U.S. Munitions List (“USML”). The USML contains a wide array of products as well as software, technical data, and services. If a company’s product, software, technical data, or services are identified on the list, the Government Agency or company is subject to the ITAR Requirements. The USML contains twenty-one (21) broad categories of products or services. One of the broadest categories on the USML is Category XXI, a catch all which includes, any product, software, service, or technical data with substantial military capability that was designed, developed, configured, adapted or modified for military purposes. ATR has established Secure Destruction Services (SDS) comprised of compliance, legal, logistics and operational professionals with additional capabilities and security clearances that identify and manage vulnerabilities in existing processes. The SDS team inspects commercial streams to locate anomalies such as hidden storage devices frequently missed by traditional processors who allow coexistence with residential e Waste materials. Additionally, we offer a complete line of destruction devices that can be deployed and used at the customers’ facilities when transportation to our secured facilities isn’t sufficient. Electronic system and computers designed, modified or configured for intelligence, security, or military purposes. Military training services and equipment. Command, control, and communications systems including radio (transceivers) and identification equipment. The Department of Defense has established specific protocols that must be followed to manage the disposal of Military Equipment and components no longer required or that equipment that ahs been deemed obsolete. These waste streams fall under the ITAR (International Traffic and Arms Regulations) and ATR’s compliance team has developed a comprehensive program outlined in our IMS Policy and Procedures which is available upon request. Only companies that are ITAR Registered can be utilized to process and provide the secure destruction for these assets. ATR offers fully compliant disposal options and use extensive monitoring and reporting for the USML Category XXI Equipment Disposal. Military Equipment is now being utilized by law enforcement agencies and it’s imperative ITAR disposal protocols be observed to ensure war gear and telecommunications equipment stays out of the hands of terrorists and criminals. ATR has established Secure Destruction Services (SDS) comprised of compliance, legal, logistics, and operational professionals to create customized solutions. The SDS team manages Military Equipment/Components streams differently than traditional scrap processors who allow coexistence with residential E-Waste materials and do not segregate and inventory product. Per ITAR and R2 we have implemented a ZERO landfill policy and qualify each downstream vendor to ensure that all recoverable commodities remain on US Soil. ATR is authorized by the US State Department and Homeland Security to provide SDS (Secure Destruction Services) to highly volatile waste streams for Aerospace, Defense, and all Federal Agencies including the FBI, FAA, and US Border Partrol. ATR also has a GSA Schedule that allows ATR to offer these same services and discounts to law enforcement and state agencies that require additional security. Since 2002, Advanced Technology Recycling (ATR) has provided a wide range of services and customizable solutions to our clients. Whether your security risk is in hard drives, electronic media, products rejects, prototypes, test equipment, or any other typpe of component requiring specialized handling – ATR has a diversified portfolio of solutions to choose from.